Form RI-1096PT-ES is a Rhode Island Department of Revenue - issued form also known as the "Pass-through Withholding Estimated Payment Voucher". 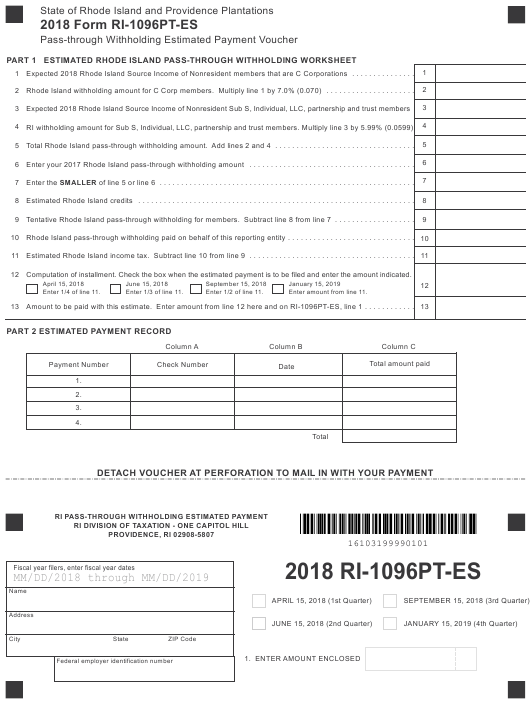 Download a PDF version of the latest Form RI-1096PT-ES down below or find it on the Rhode Island Department of Revenue Forms website. Expected 2018 Rhode Island Source Income of Nonresident members that are C Corporations . . . . . . . . . . . . . . .
2 Rhode Island withholding amount for C Corp members. Multiply line 1 by 7.0% (0.070) . . . . . . . . . . . . . . . . . . . . .
5 Total Rhode Island pass-through withholding amount. Add lines 2 and 4 . . . . . . . . . . . . . . . . . . . . . . . . . . . . . . . . . Enter your 2017 Rhode Island pass-through withholding amount . . . . . . . . . . . . . . . . . . . . . . . . . . . . . . . . . . . . . . .
7 Enter the SMALLER of line 5 or line 6 . . . . . . . . . . . . . . . . . . . . . . . . . . . . . . . . . . . . . . . . . . . . . . . . . . . . . . . . . . . .
8 Estimated Rhode Island credits . . . . . . . . . . . . . . . . . . . . . . . . . . . . . . . . . . . . . . . . . . . . . . . . . . . . . . . . . . . . . . . . .
9 Tentative Rhode Island pass-through withholding for members. Subtract line 8 from line 7 . . . . . . . . . . . . . . . . . . .
10 Rhode Island pass-through withholding paid on behalf of this reporting entity . . . . . . . . . . . . . . . . . . . . . . . . . . . . . .
11 Estimated Rhode Island income tax. Subtract line 10 from line 9 . . . . . . . . . . . . . . . . . . . . . . . . . . . . . . . . . . . . . . .
Computation of installment. Check the box when the estimated payment is to be filed and enter the amount indicated. Enter 1/4 of line 11. Enter 1/3 of line 11. Enter 1/2 of line 11. Enter amount from line 11. 13 Amount to be paid with this estimate. Enter amount from line 12 here and on RI-1096PT-ES, line 1 . . . . . . . . . . . .